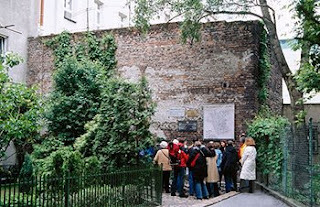 In a quiet residential neighborhood are the remains of the Warsaw Ghetto wall. Except for a few plaques the wall is discreet. Tucked within a courtyard it would be easy to miss if you weren’t looking for it. Hundreds of thousands of Jews were imprisoned within the walls of the ghetto before being transported to concentration camps. Most of the wall was leveled following the month long Warsaw Ghetto Uprising. It was the largest Jewish resistance during World War II. This month marks the 65th anniversary of the uprising, which began on April 19th 1943. The wall is not too far off the beaten path. To get to it you need to pass through an archway of an apartment block. If the gate is closed ring the bell. The residents don’t seem to mind. You can find the wall at 55 Sienna Street, close to Warsaw’s main train station. Here is a map.